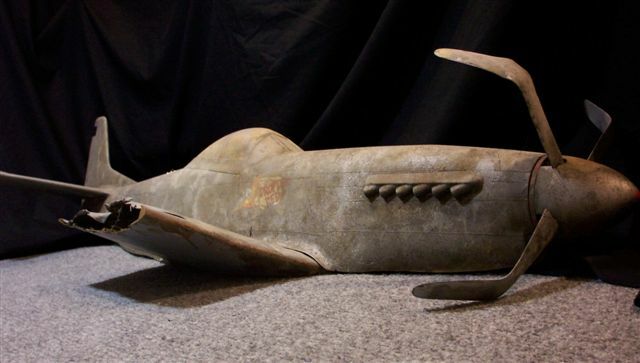 Popularized by a photo article in the December 1992 issue of SCALE SHIP MODELER MAGAZINE, Dan Kachur’s incredible Radio-Controlled NAUTILUS replica is a favorite amongst Leagues fans everywhere. 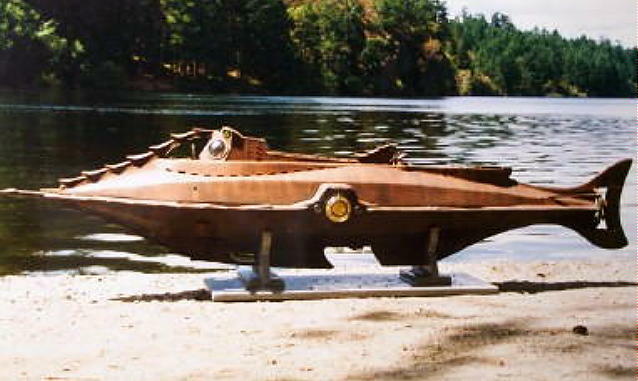 Here’s a look at Dan’s NAUTILUS as it rides on a serene lake: a very convincing image! 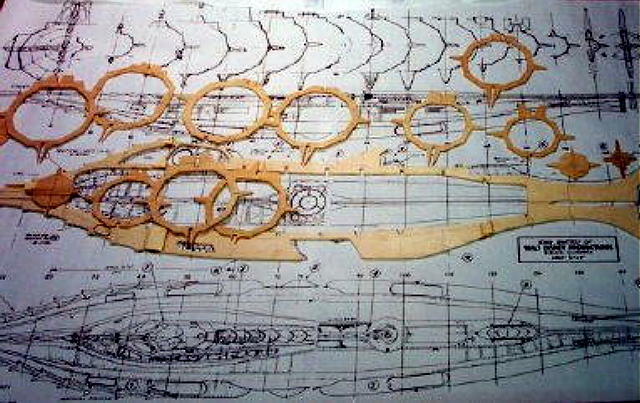 These are some of the ribs and formers after being cut from wood with reference to the the Disney “Courtesy Of” Plans, as published in SCALE SHIP MODELER magazine. Here we see the framework coming together: a stage of the process all NAUTILUS modelers know well. 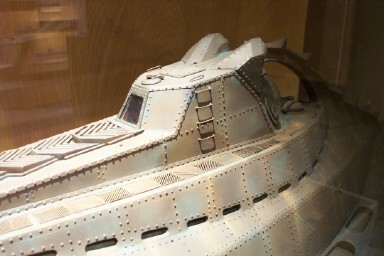 With the skin and deck grates in place, the rivet detail is next. 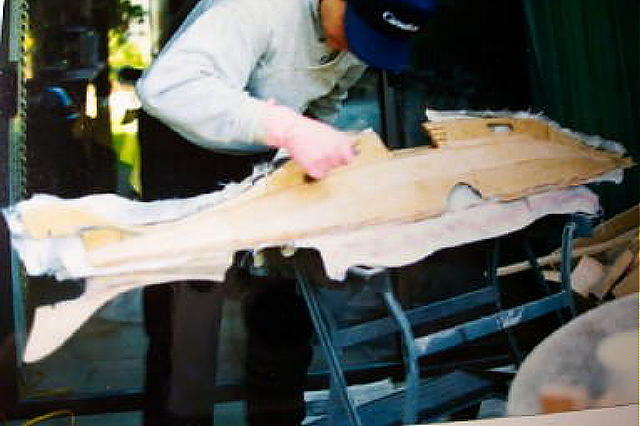 Here, we see Dan doing the fiberglass work on the lower half of his hull. And here, Dan’s using an airbrush to lay down the first dark brown base coat for the now-familiar “NAUTILUS RUST” finish. But this boat is not just for show; she goes, too. 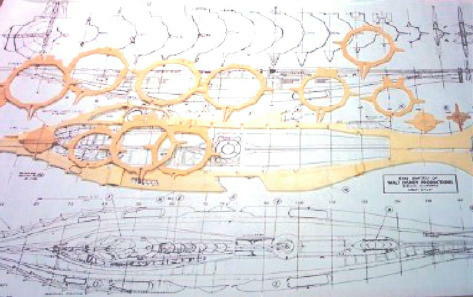 Here’s a look at the schematic Dan devised for the inner workings of the Radio Control propulsion and guidance system. 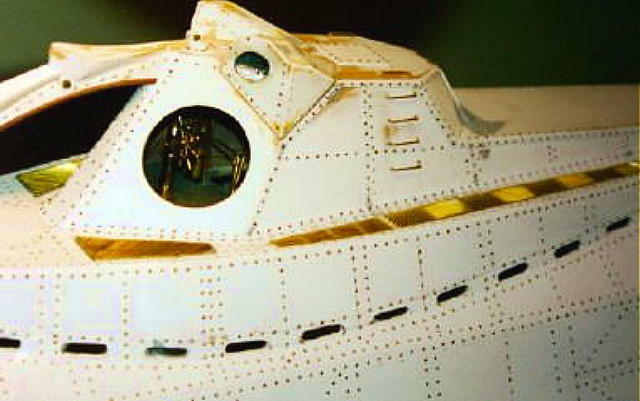 And here’s a look at the open hull with the R/C components in plain view. 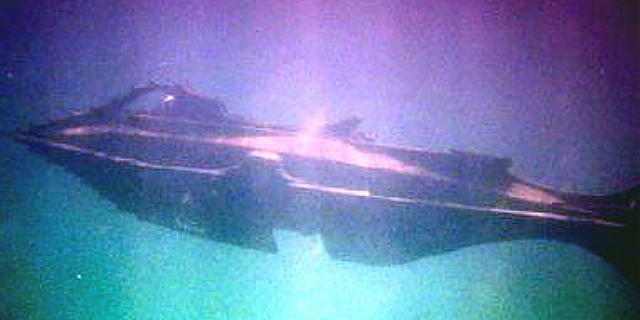 A variation of this shot made the cover of the 1992 SSM magazine which featured Dan’s NAUTILUS. 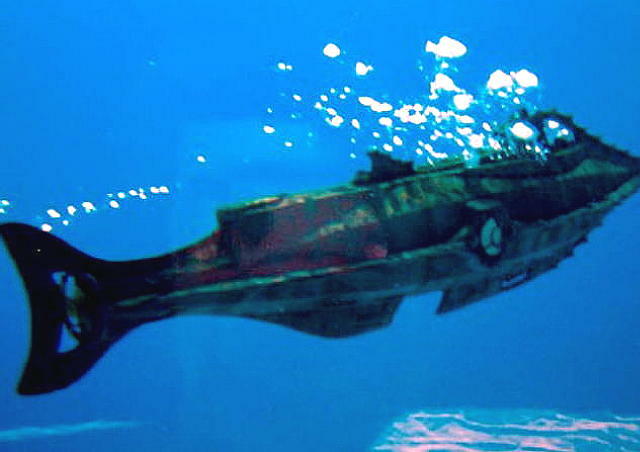 Here’s another view of the model underwater. With a little different coloring, this image might easily be confused for a scene from 20,000 Leagues Under the Sea. 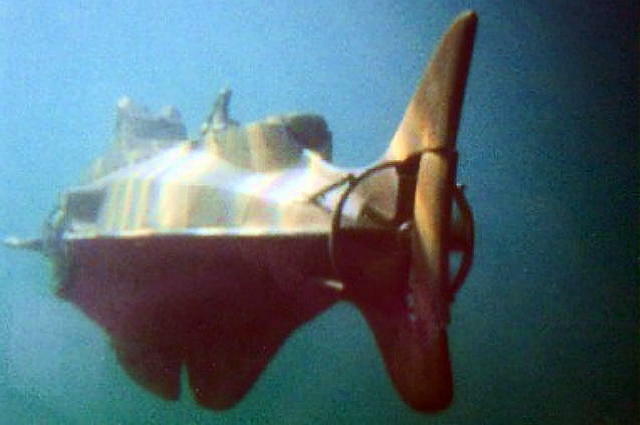 I really like this picture: Dan’s NAUTILUS “blowing ballast” with the quad planes set to ascend. 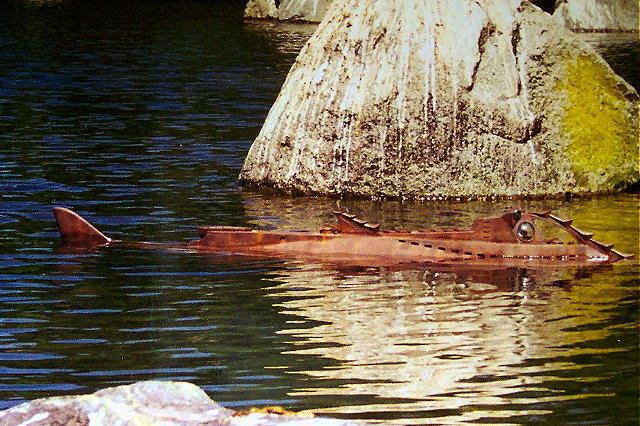 Shooting the sub in a lake rather than a swimming pool really enhances the photo-realism factor, doesn’t it? 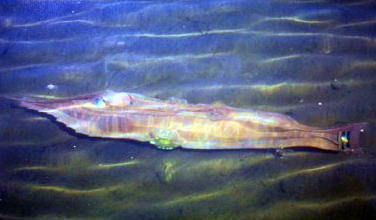 And here’s the “squids-eye-view” as the NAUTILUS passes by. 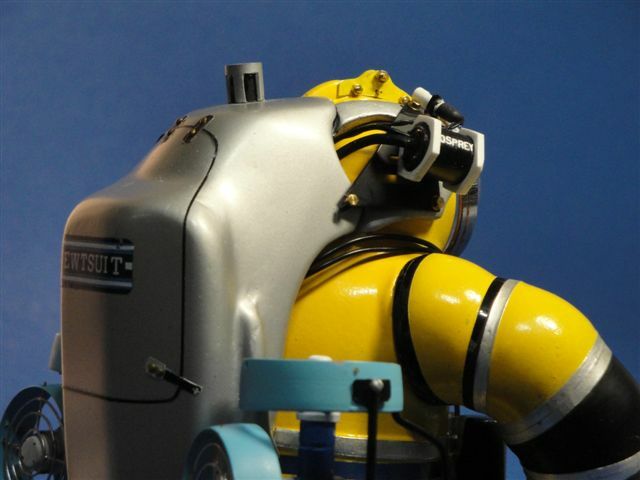 Dan Kachur’s Radio Control Disney NAUTILUS at lakeside on a successful day of underwater ops. 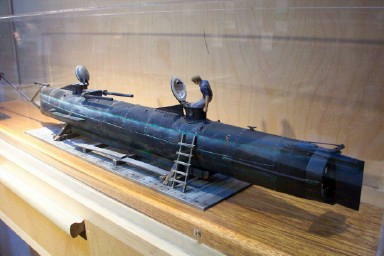 These figures of Ned Land and Captain Nemo were made by Lester Lessa Jr. of San Francisco, in the same scale as Dan’s sub (1:35). Looks like this scene portrays the day when Ned was trying to talk Ol’ Nemo into letting him go ashore, and almost ended up on the local lunch menu. 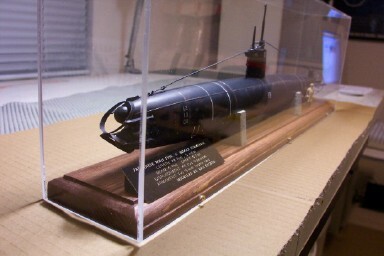 A nice portrait of the model on its display stand. 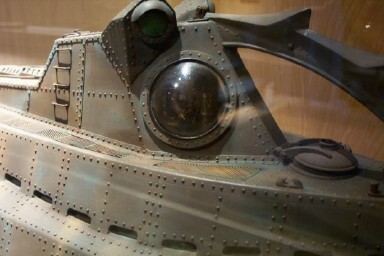 Truly a 1st class NAUTILUS replica. 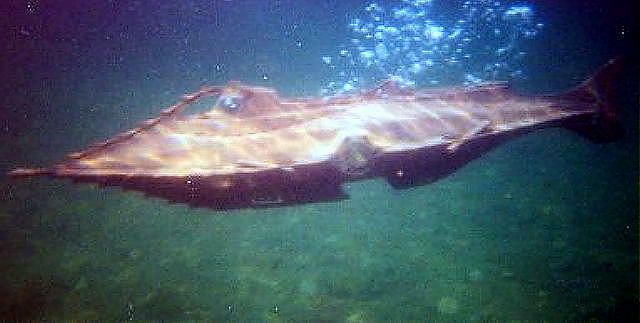 Here’s a really great shot of the NAUTILUS running on the surface. 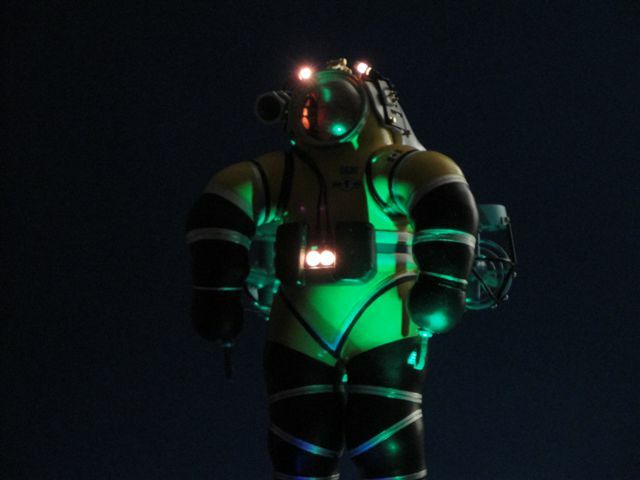 This picture (taken by Dan’s wife Bertha) has nothing to do with the NAUTILUS, but I’m sure Leaguers everywhere will enjoy seeing it. That’s Dan on the right, and the gentleman on the left is, of course, none other than Tom Scherman. This photo was taken at Tom’s Hollywood apartment on July 02, 1993. 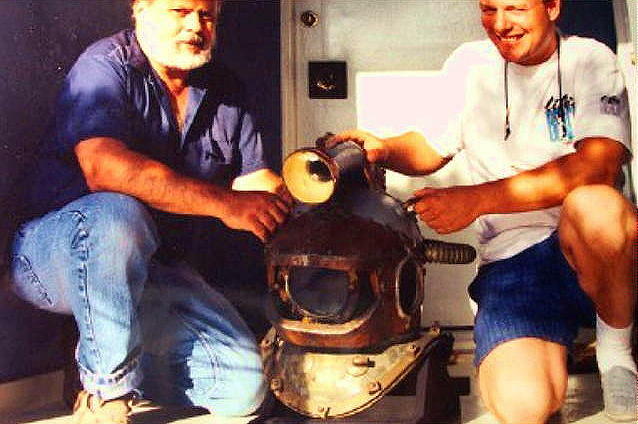 And (if any of you are having difficulty identifying the object on the floor between them) yes, that’s the original NEMO helmet used in the underwater scenes of Disney’s 20,000 LEAGUES UNDER THE SEA. Truly a significant artifact. 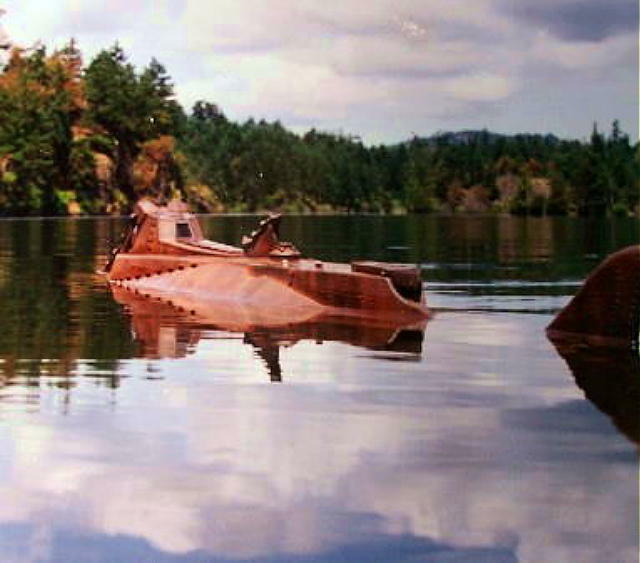 For the benefit of those of you who might be wondering what’s become of Dan’s SSM NAUTILUS: it’s on display at the Granville Island Museum in Vancouver. 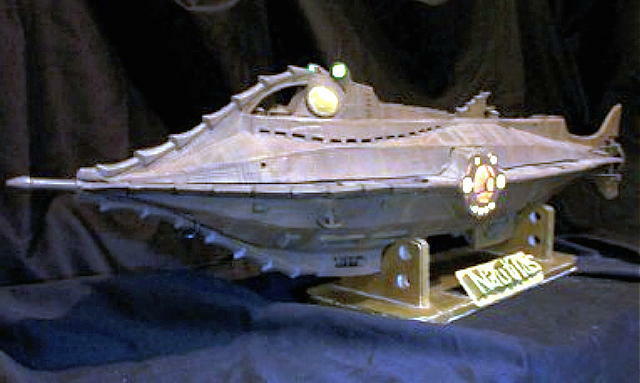 The model below it is a Jules Verne NAUTILUS concept which Dan built based on one of Greg Sharpe’s hulls. Here’s a closeup of the Wheelhouse from slightly aft. Great attention to detail and a fine paint job! 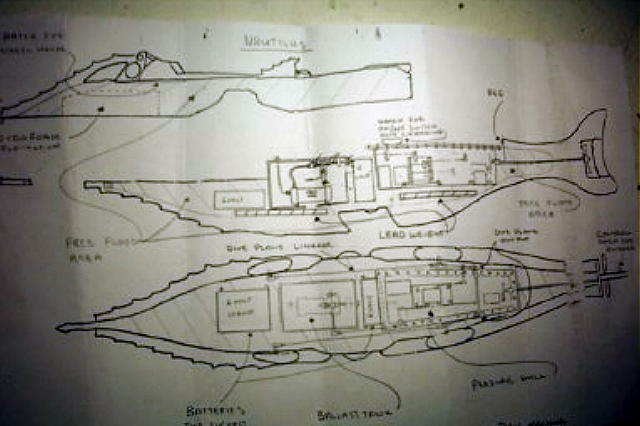 For those of you “purists” out there who might scoff at the plans-type wheelhouse lights, remember: this model was made back in 1992: long before that particular detail became a bone of contention. 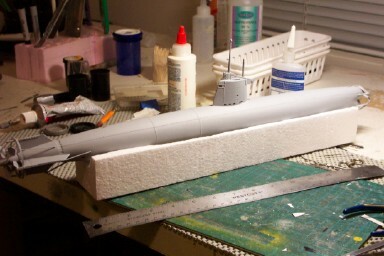 Here’s a look at the ramming spur of Dan’s Jules Verne Nautilus, based on a Greg Sharpe hull. Seen from aft on the port side, the overlapping hull plates are apparent. 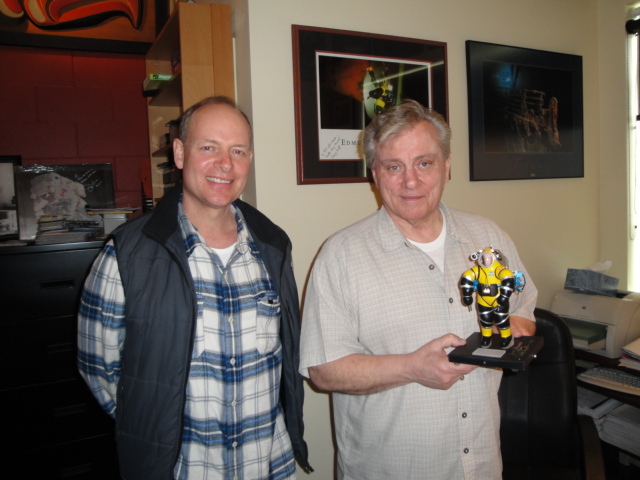 Here’s another model Dan made for the Museum in Vancouver. Can you guess what it is? Maybe we should have a poll. The winner get’s to ….call himself the winner for a week. Nahhh! Homey don’t play that! 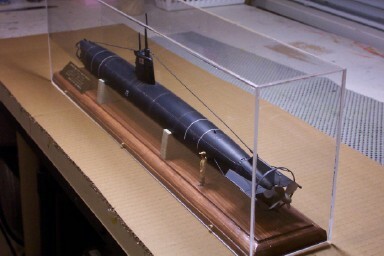 J Obviously, this is a fine scale replica of the Confederate submersible H.L. 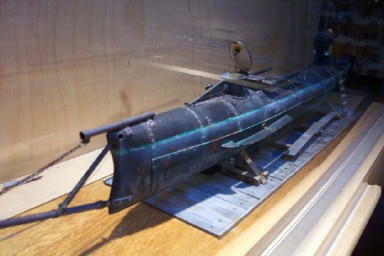 HUNLEY, circa 1864. A really nice treatment, I think: with the dock-planking base, ladder, and crewman sliding down into the aft hatch. I’m guessing this is about 1:48 scale. Dan can confirm or deny. 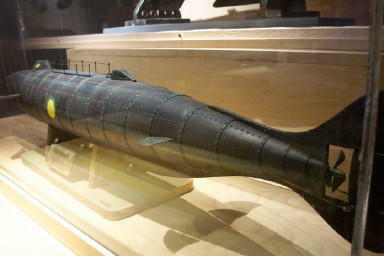 The business end of the H. L. Hunley. 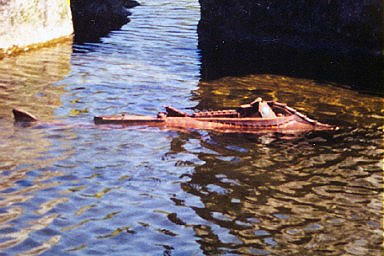 The shape of the bow and the rigging of the spar torpedo seem to be in accord with what we’ve learned about this boat since it was salvaged by Clive Cussler and crew. This is museum quality all the way. But hey! Why stop there? Here’s another of Dan’s creations. 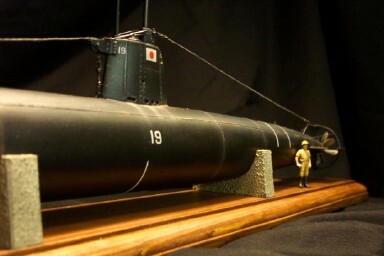 This one’s a scratchbuilt 1:48 scale Japanese WWII Type A two man minisub: type HA 19, to be exact. Obviously, this shot was taken while the model was nearing completion. 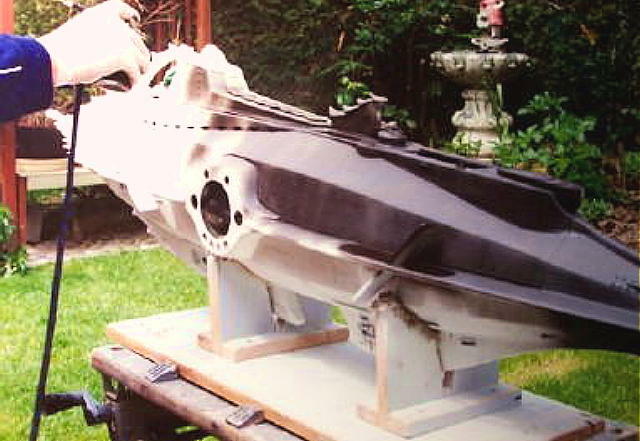 A close-up of the stern section before the paint went on. Check out those counter-rotating props. 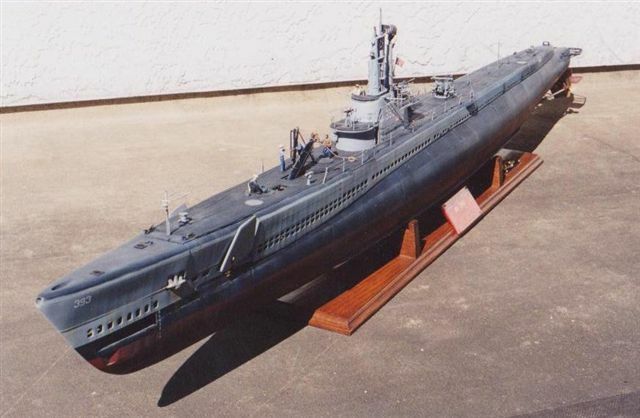 I’ve seen many pictures of this type of submarine. The attention to detail here is excellent. And here’s the finished model, sitting on simulated concrete blocks like those used in displays of actual surviving minisubs seen in places like the U.S. Navy’s Bowfin Park at Pearl Harbor, Hawaii. 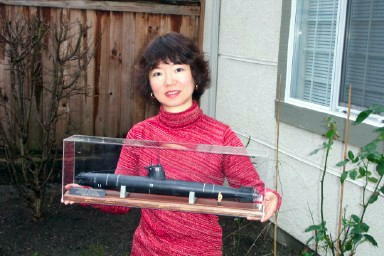 Dan’s wife Bertha Kachur proudly shows us the newly finished HA-19 in its acrylic display case. And here is a closeup of the finished model and case. 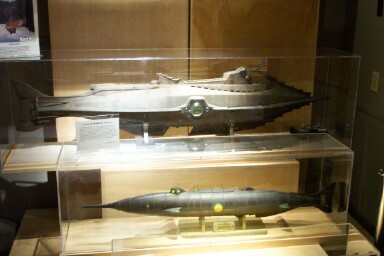 In the bow we see two torpedoes mounted in over-under “Derringer style”, and an information plate describing the nature of the HA-19. An aft view of the HA-19. 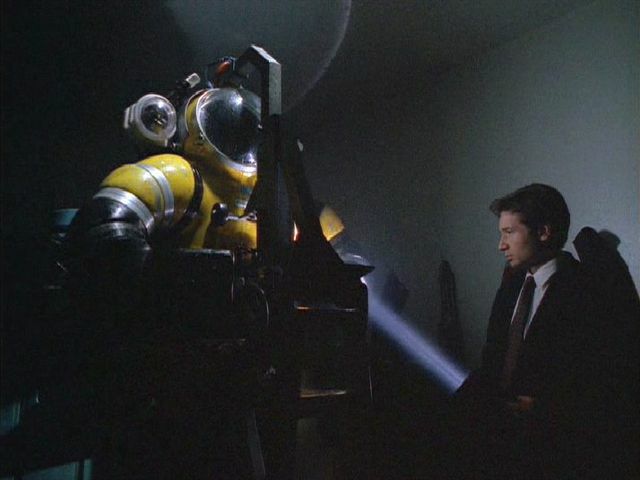 We can see a scale crewman standing by, giving us a reference as to the size of the actual submarine. Here’s a view with the acrylic case removed. Truly a fine rendition of an awesome weapon from years long-since past. 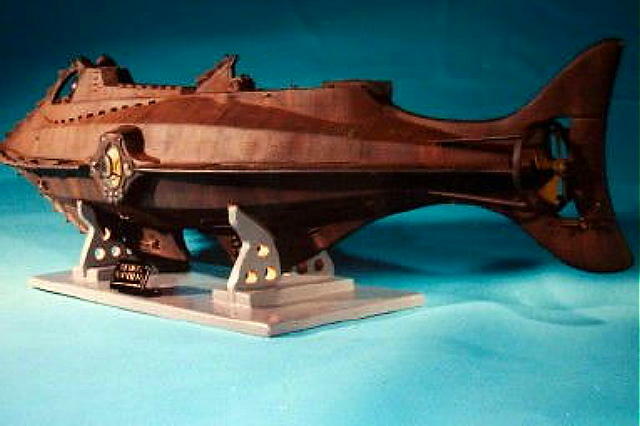 OK, let’s get back to NAUTILUS models again. 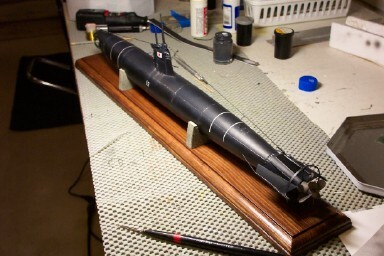 This is a model that Tom Scherman made and gave to Dan Kachur. It’s 33 inches long. 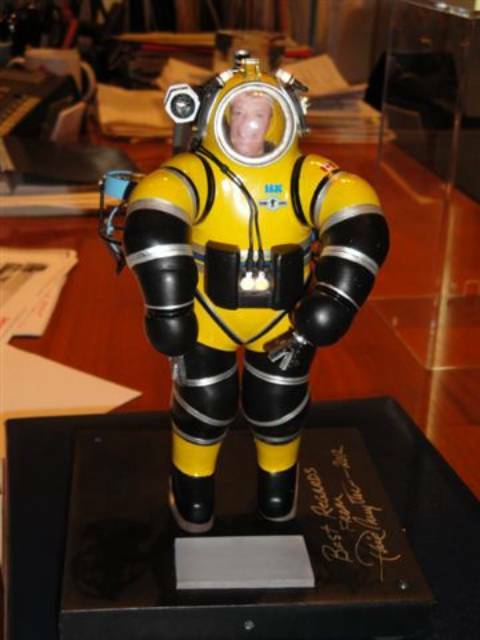 The 50th Anniversary Nemo Helmet miniature and Organ collectibles give a good idea of the size. 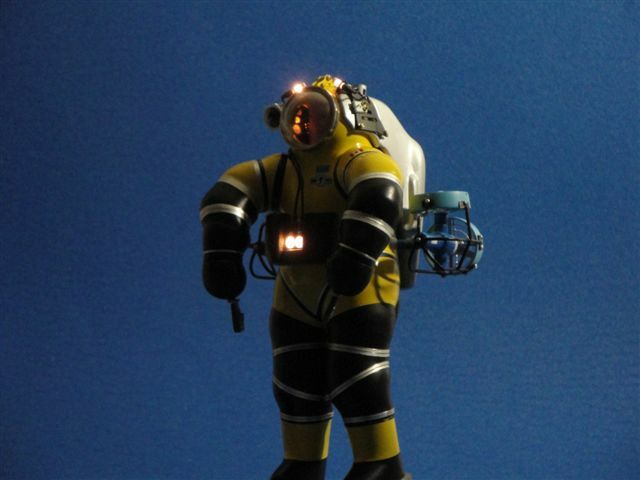 None of Tom Scherman’s models were rigged for R/C. Dan told me the model he received from Tom was very heavy; so he made some molds, cast epoxy parts, and made a R/C version of his own. 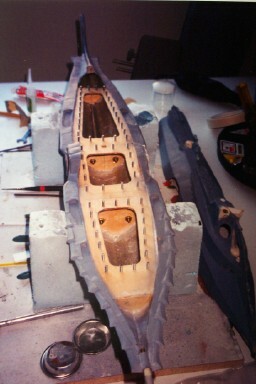 This is that model during construction, with the internal compartments visible. 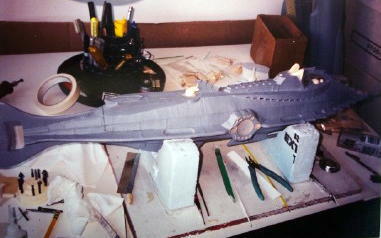 Here’s Dan’s 33-inch R/C Scherman NAUTILUS with the top cover in place, obviously during taken construction. 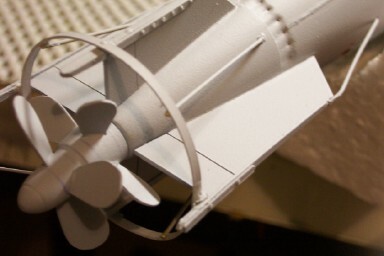 And here’s a look at the finished model with the top cover removed, showing the internal workings of the R/C sub. 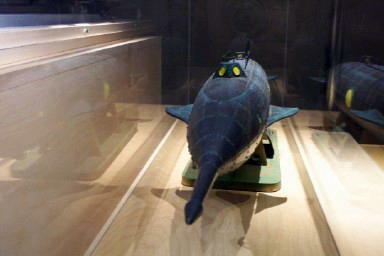 With the cover on, the customary Front ¾ View of Dan Kachur’s R/C Scherman NAUTILUS. 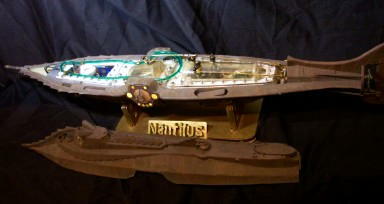 And here’s a look at Dan’s 33-inch R/C Scherman NAUTILUS running on the surface. 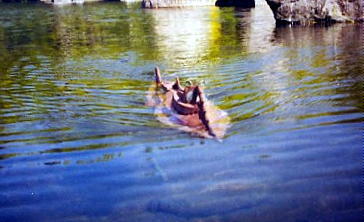 The 33-incher cruises by fully submerged. 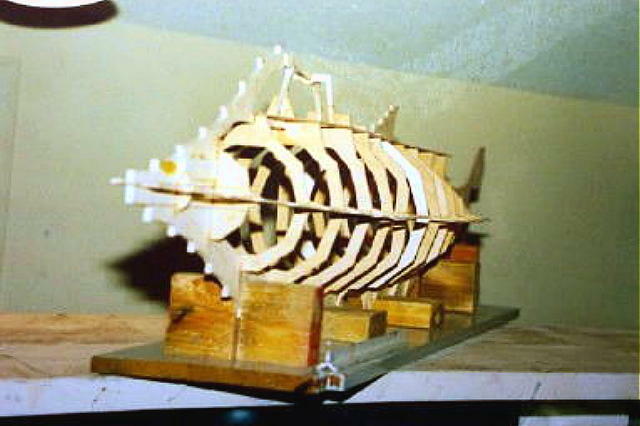 Dan Kachur built SFX models for the X-Files episode Piper Maru back in 1996. 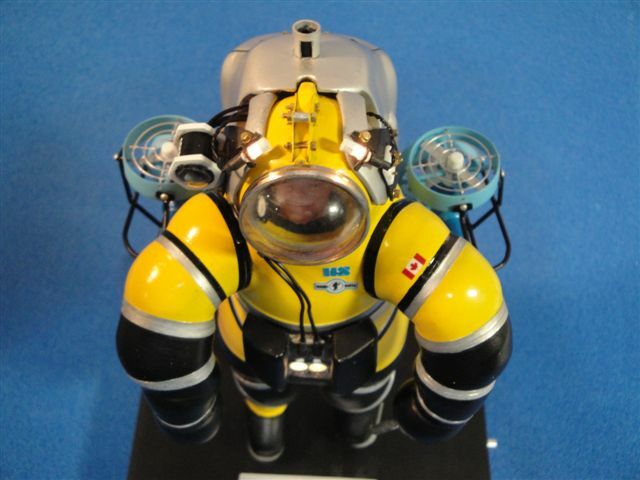 Among them: a fine scale replica of Dr. Phil Nuytten’s NEWTSUIT. Lately, Dan’s reprised the filming miniature with a replica cast from the original. Check it out. 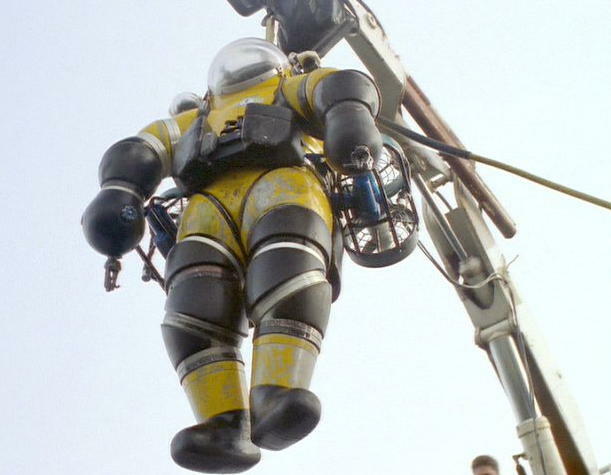 The Queenfish: used in filming X-Files episode Piper Maru. 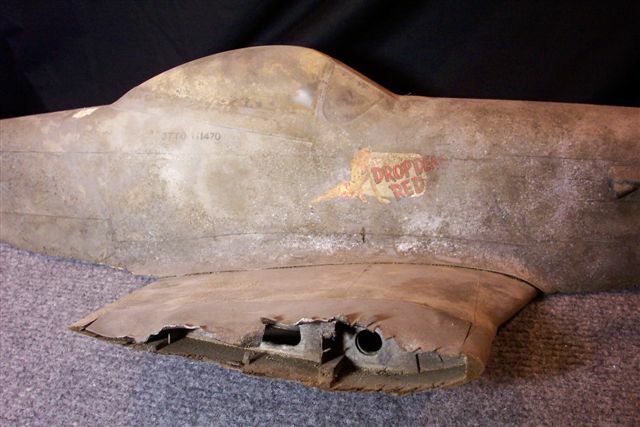 A P-51 fighter, wrecked on the bottom of the sea. 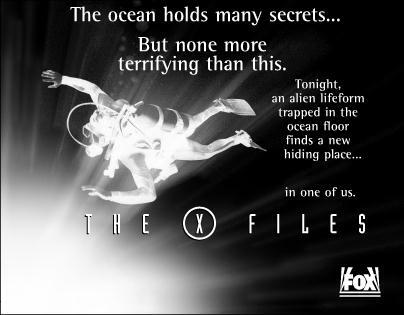 This miniature was also used in filming the X-files episode. 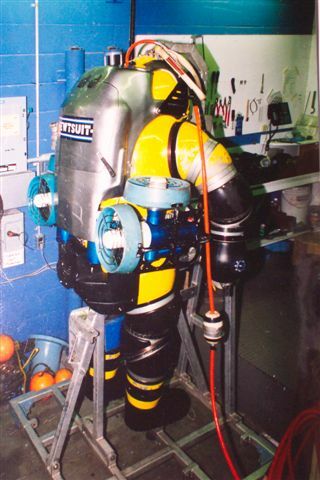 The real thing: a NEWTSUIT on the job. And here’s a scene from the show. 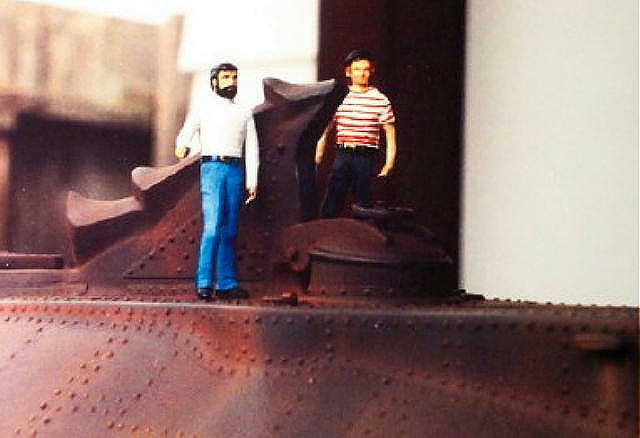 But tell me: is this the real thing, or a miniature diorama? 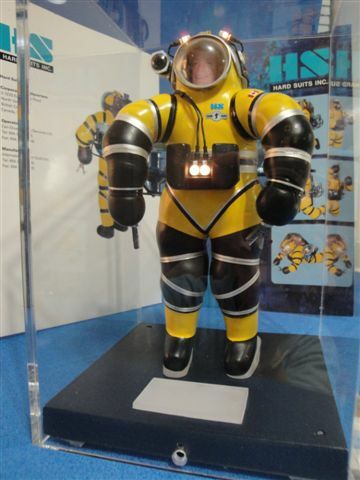 Here’s some pics of Dan Kachur’s 1/12th Scale NEWTSUIT. 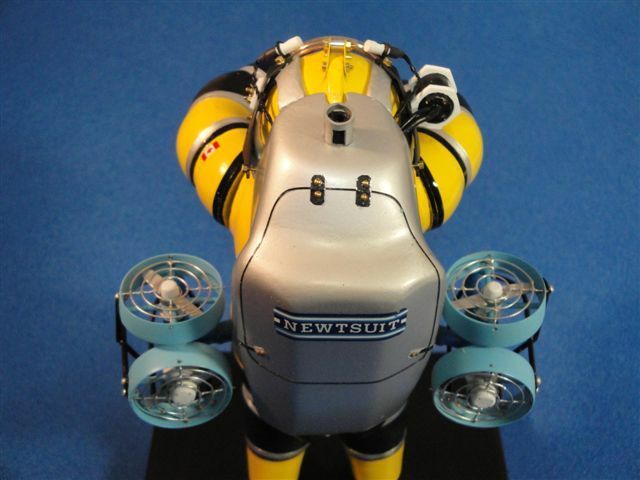 My understanding is that Phil Nuytten has expressed in interest in this replica, and perhaps one of his Exosuit. Maybe we’ll be seeing that here in the future. As always, great work, Dan. Dan Kachur during a recent visit to the home of the Newtsuit. 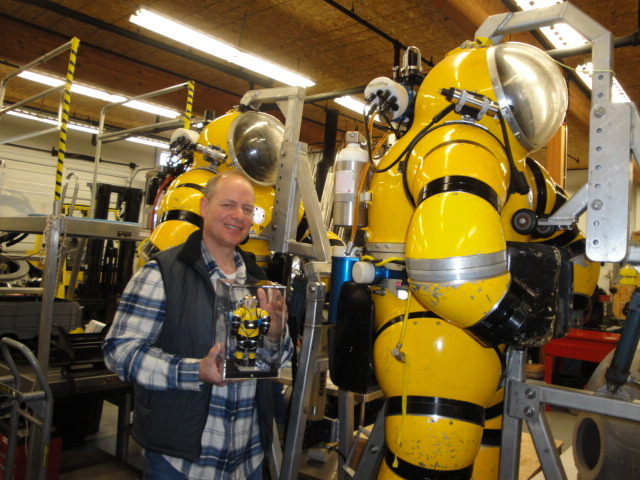 Dan Kachur and Dr. Phil Nuytten, at NUYTCO in Canada with Newtsuit replica. Please do not copy these pictures without written consent from Dan Kachur.